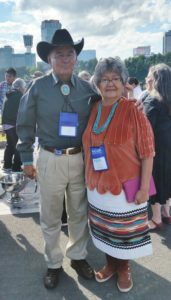 NICOA is dedicated to advocating for improved comprehensive health, social services and economic wellbeing for American Indian and Alaska Native Elders. The month of November is American Indian and Alaska Native Heritage month and an opportunity to celebrate the diversity of American Indian/Alaska Native (AI/AN), including the cultures, traditions, and histories, and to acknowledge the important contributions of Native people. Watch a Native Elder Storytelling video. NICOA presents heart-felt short videos made by Native Elders, about lives lived with courage, humor and resilience. Through these stories NICOA seeks to help educate and encourage Tribal Communities, the Aging Network and policy makers to positively impact the future of American Indian and Alaska Native Elders. Each Elder’s story is a living legacy for generations to come. Read “Everything You Wanted to Know About Indians but Were Afraid to Ask” by Anton Treuer. Read the Presidential Proclamation declaring National Native American Heritage Month. Chart your family health history. Knowing your family history is important to understanding your risk for disease and helping your clinicians provide the best care. The My Family Health Portrait tool from the U.S. Surgeon General’s Office provides a private and easy-to-use web-based resource to organize family health history information.